What is Temecula’s homelessness problem? Mayor Maryann Edwards made the “growing homeless problem” a big issue during her election campaign, but it isn’t like there has been a flood of homeless into the city. As of 2013, according to the Press-Enterprise article, there were 80 identified homeless persons in the city, with 50 deemed “unsheltered”—that is, living in places not meant for human habitation, like parks or abandoned buildings rather than shelters or transitional housing. The strategy, as proposed by city staff to the City Council, calls for collaborating with nonprofit organizations and churches, providing “comprehensive services that will provide support and a path to self-sufficiency,” and spending no taxpayer revenues. 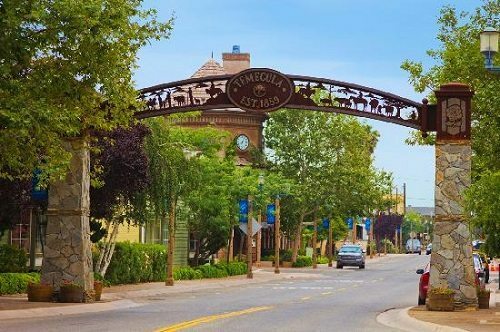 The program is “to eliminate homelessness in Temecula with a hand up, not a handout and to hold participants accountable for their actions,” according to a report from Kevin Hawkins, director of the city’s Community Services Department. After the complaints, the city began to look into TEAM’s operations and decided to put the pantry operation out for bids. Only one bid was deemed responsive—from Community Mission of Hope, a pantry operation arm of Rancho Community Church, where Mayor Edwards is a member. In addition to her job as mayor, Edwards is president/CEO of the Southwest County Boys & Girls Club, which has a clubhouse just north of the pantry.